This made the Houston Chronicle's list of the weirdest Texas headlines of 2017. 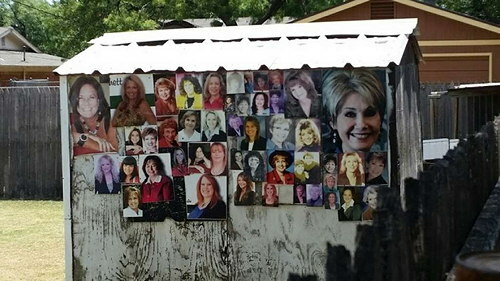 As far as I know, the mystery of who put photos of local, female real estate agents on the shed (or why they did it) wasn't solved. 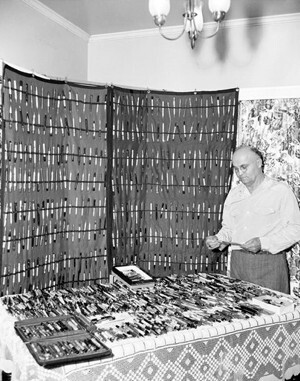 I don't know what kind of response he got, but here's a picture of him in 1952 with his collection. The picture ran in various papers. I can't find any information about what became of Tucker's collection. Was it thrown away when he died? Or is it sitting in a box in someone's basement? Who knows. 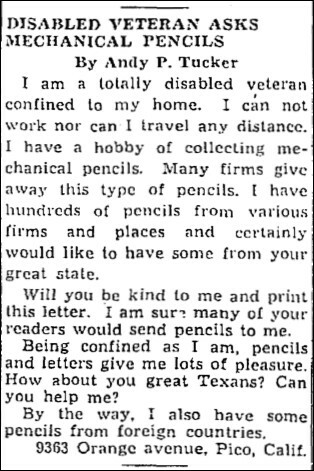 However, Tucker isn't the only person to have collected mechanical pencils. 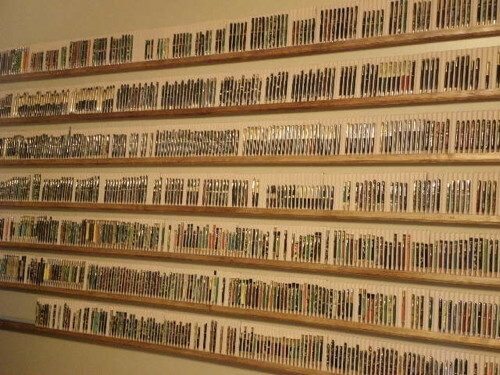 Jonathan A. Veley now maintains what he calls his Mechanical Pencil Museum, with an accompanying Leadhead's Pencil Blog. But a search of Veley's blog doesn't produce any references to Tucker, so I'm not sure if Veley is aware of his predecessor. The dark heart of a popular British pass-time was thrust into public view this week when allegations of sabotage, rustling and murder shook the world of... competitive budgerigar breeding. 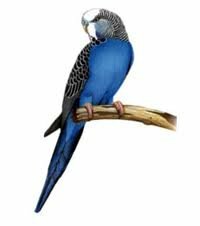 On the eve of the prestigious Cornwall Budgerigar Show, the aviary of Andrew Pooley, one of South England's top budgie breeders, was broken into and 21 of his best birds were stolen. Worse still, several birds were badly injured and one, reigning "best of breed" title holder Penmead Pride, had been killed. Stamped on by the callous intruders. Because their distinctive markings would be instantly recognised among the close-knit budgie fancying community, the score of stolen budgies are unlikely to ever make another show appearance. And that might suit the culprit just fine, if his intention was to eliminate the competition by fair means or (can't resist, sorry) fowl. Pooley had left the shed unlocked briefly when he ran an errand to the nearby town of Camelford from his home in Delabole in Cornwall, and only noticed something was wrong at 9.45 that evening, when he came to make a final check on his prized birds and was - in an suitably Harrissian moment - startled by the silence of the budgies. Police are still investigating whether this is the work of a competitor but Mr. Pooley is in no doubt. "The person or people who did this must have known exactly which ones to take because they only targeted my show team," he told reporters (Daily Mail). I don't think I want to be on the road with this driver. 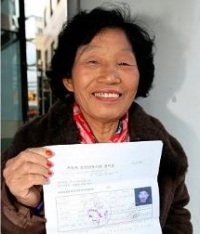 After 960 attempts, this South Korean driver is the proud owner of her very own driving license. If you spend your life riding Harley's, who wants to go to your own funeral in a car? Why not use this unique service -- get towed there by a Harley? What's next? A VW bug hearse? A MiniCooper hearse? When I was very little, growing up in a small suburb of Charleston, South Carolina, one of the most exciting things to do was to sit outside the barber shop and wait for the train to roll through town. Some people might say that would be as boring as watching grass grow, but they are not "railfans". So what's a railfan? The people who camp out for hours, and even days, to watch a train go by. According to Train Magazine, there are over 175,000 railfans in the United States and more than 24,000 railfan videos on YouTube. Bill Taylor, from Montana, sums it up the best by saying "It's an orchestra of motion." Learn more about railfans here. 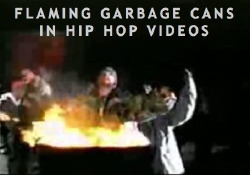 In response to my post about the catalog of one-shoe movies, Prof. Music sent this link to the Flaming Garbage Cans in Hip Hop Videos blog. I don't get the same sense of sexual fetish from the garbage can blog as I do from the one-shoe movie list. Though I could be mistaken. And along similar lines: The Brokers With Hands on Their Faces blog. "Droppedit" is a man who knows exactly what he likes, and that is "movie and TV scenes in which women happen to lose their shoes." I think it's fair to say that his catalog of such scenes (with accompanying pics) will never be equaled.